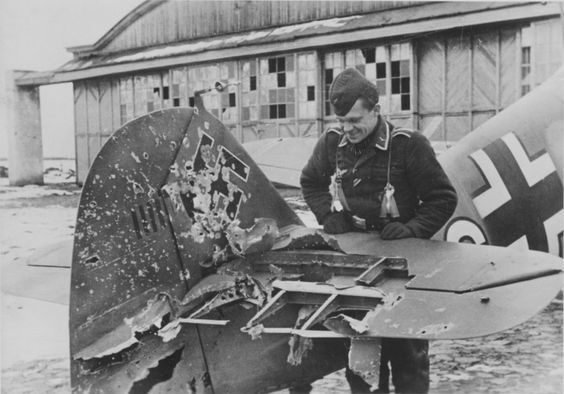 This Focke-Wulf 190 pilot was very lucky to be alive, much less land the plane. That would be the exit hole, with the shot coming from the other side. During World War II, the newspapers took to showing photos in most editions of planes that were all shot up but still managed to keep flying and make it back to base. This is Hurricane Mk I YB-S. After sustaining this cannon damage, 19-year-old Pilot/Officer David C Leary had to force-land near Bolbec, France on the afternoon of 9 June 1940, a day after having withdrawn with No 17 Squadron RAF to Brittany. Leary returned by train to Le Mans, arriving 2 days later and quickly got a new mount. He shot down a Bf 109 on 12 June and another on 13 June. Retiring from Dinard to Jersey and Guernsey on 17 June, Leary withdrew once again to RAF Debden 2 days later, one of the last RAF pilots to withdraw from France. It became almost a standing joke as to how little of a plane could be left and still not crash. These were usually bombers because those were the planes that were the toughest, but even fighters can take an awesome amount of pounding and still land safely. American crew demonstrate the size of a hole in the wing of a B-17, resulting from German flak during a raid on Ludwigshafen, 1944. Let's take a look at some battle-damaged planes of World War II that barely survived. 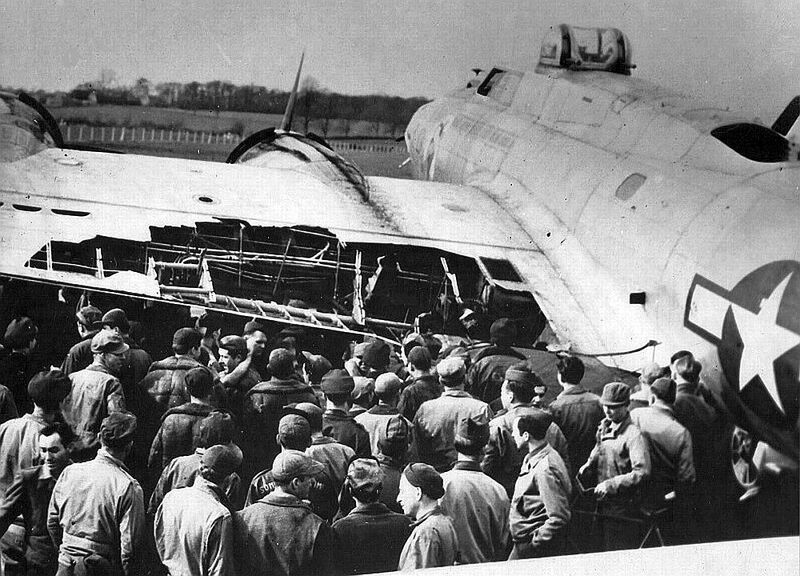 This B-17 returned from a Frankfurt raid. Flak blew rear gunner Roy Urich out and he became a POW. 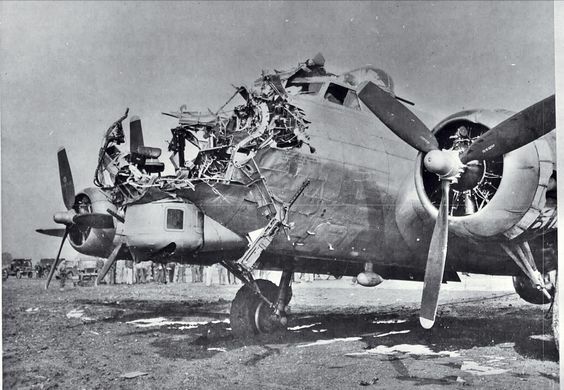 B-17s were legendary for surviving incidents like this. The next one below deserves special mention. This is "Sweet Pea," a Boeing B-17G in the 2nd Group, 429th Bombardment Squadron, 5th Bomb Wing, 15th Air Force. On Mission 279, it was flying over the Debrecen, Hungary, marshalling yards on 21 September 1944 when it was hit by a 88mm Flak gun. Normally, a direct hit from an 88 would destroy just about anything, including a tank. However, Sweat Pea made it back to Amendola air base at Foggia, Italy, 600 miles away. It only had one control cable left. 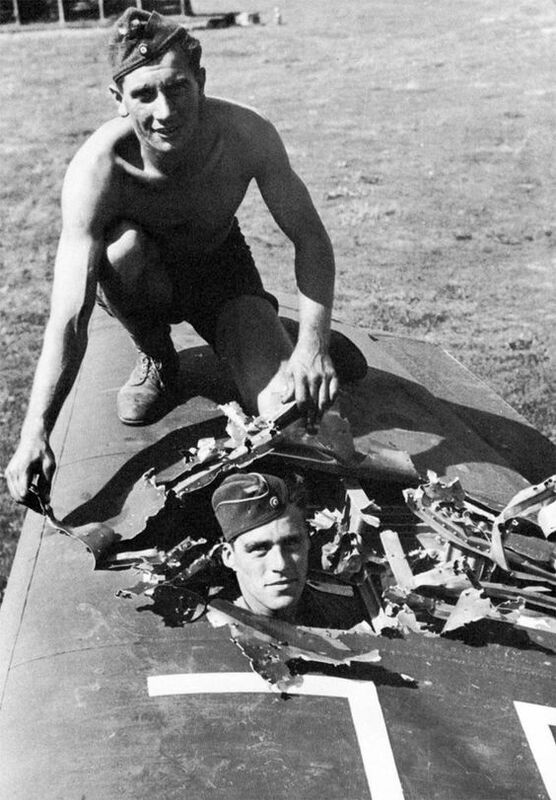 The tail gunner and left waist gunner perished, everyone else survived. Incredibly, the plane was repaired and flew more missions. Congrats to the pilot, 2nd Lt. Guy M. Miller, the navigator 2nd Lt. Theodore Davich, and everyone else. I don't have any information on whether the ball turret gunner had to sit through that landing, but his hatch is open. Some hits show just how much of a plane really isn't needed - if you just want to get home. 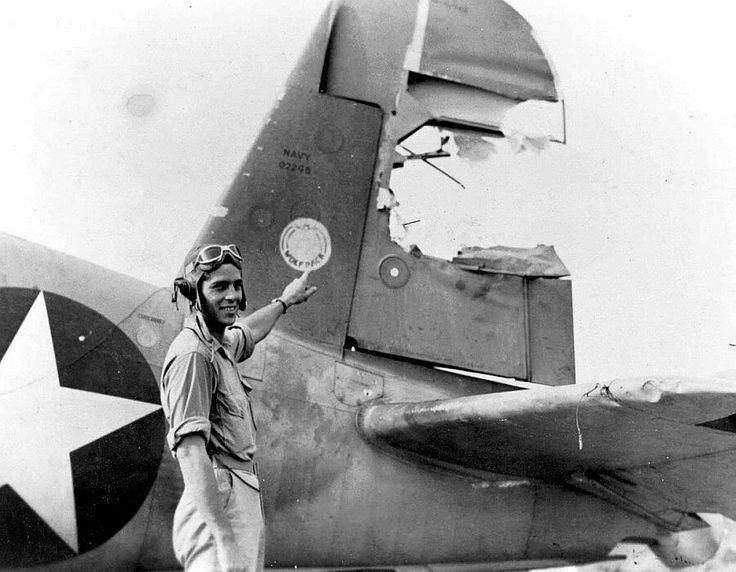 An amazing save: Lt Jimmy Johnson, USMC, points to the damaged rudder of his F4U Corsair fighter bomber after an encounter with the Japanese over the Russel Islands, flying out of Guadalcanal. 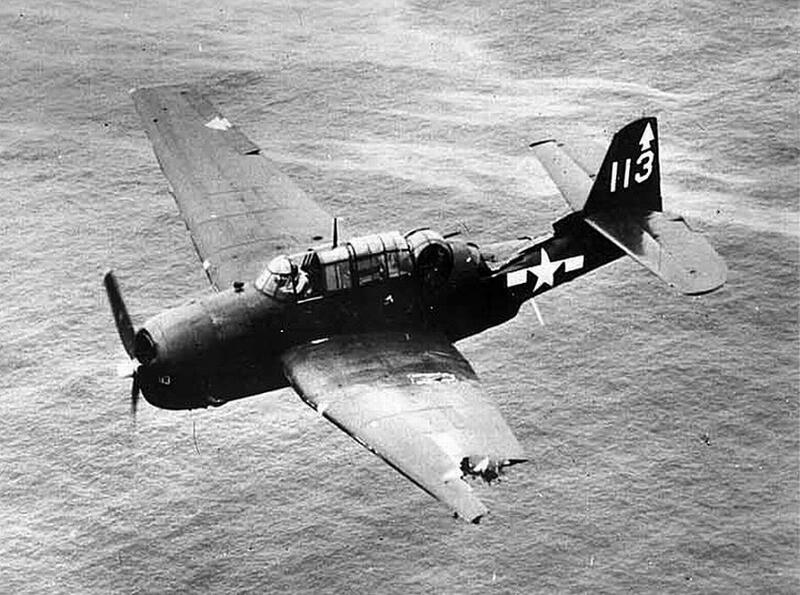 Johnson succeeded in retaining control of his aircraft despite the absence of a rudder and bringing her in for a forced landing with no further damage. 1943. Japanese antiaircraft fire seldom gets much attention. However, it was just as deadly as German or British artillery. 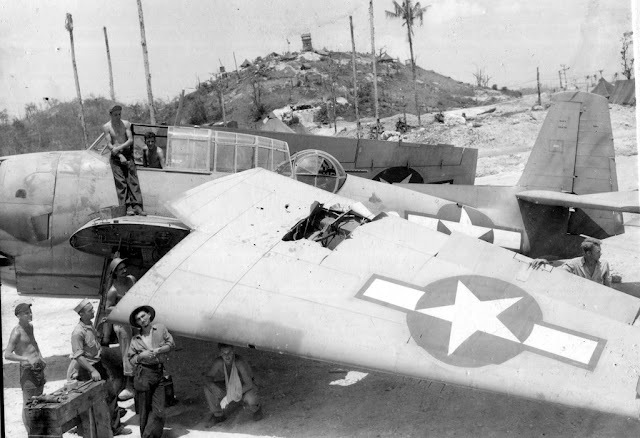 "80-G-295284 TBF-1 at Munda with damaged wing as a result of Japanese AA fire Oct 1943" (National Archives Still Picture Research Room via Donald Larson, author of "Lucky's Life," at Warbird Information Exchange). Anyway, the pictures mainly speak for themselves. Some of them have little background on them - some mechanic or pilot simply snapped a picture and then developed it months or years later, never recording what had happened. But you can pretty much get the idea just from what's there, and what's missing. 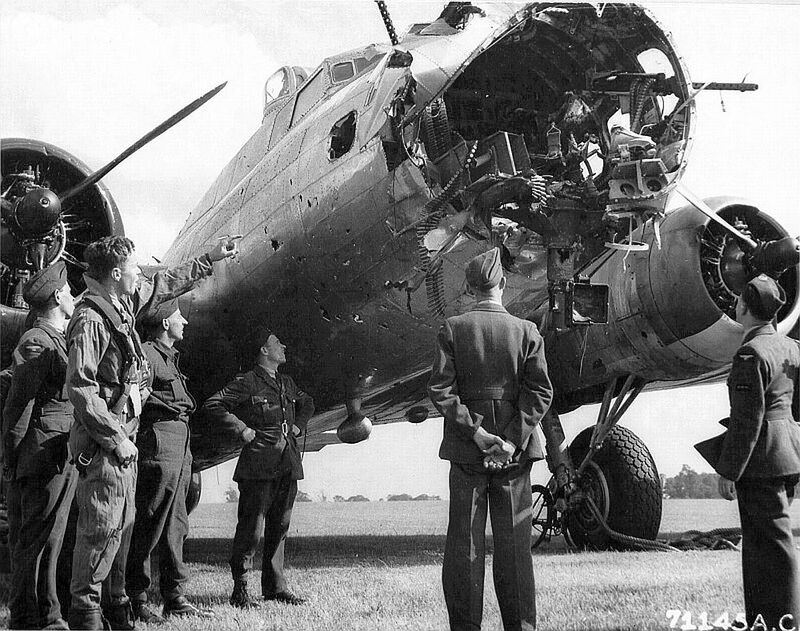 Crews examine flak damage to a B-17G Fortress at RAF Bassingbourn, Cambridgeshire, England, UK. 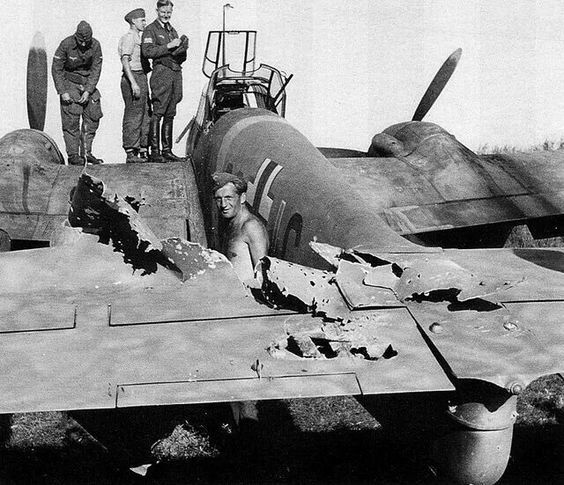 Damage sustained on mission to Munich, Germany, July 6, 1944. Note "Mickey" pathfinder radar dome in place of ball turret, so this was a lead plane (United States National Archives via D. Sheley). Ilyushin Il-4 Long-range bomber-torpedo carrier with its tail shot off. 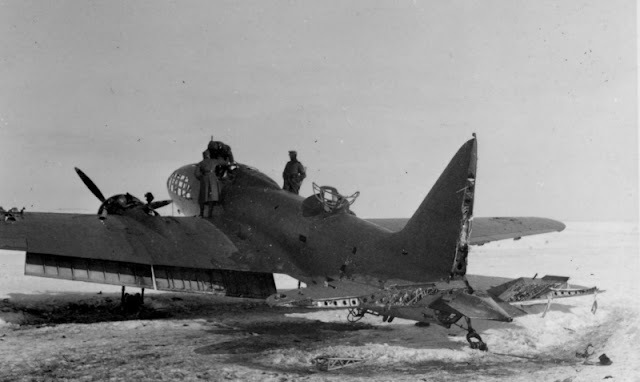 The Soviets did not seem to document much of their battle damage. Stalin was so paranoid that he probably would have blamed the crews for sabotage if they came back with a damaged plane. Pilots had a lot of incentive to make it back to base on the Russian front, because if the enemy got you, bad things generally happened. 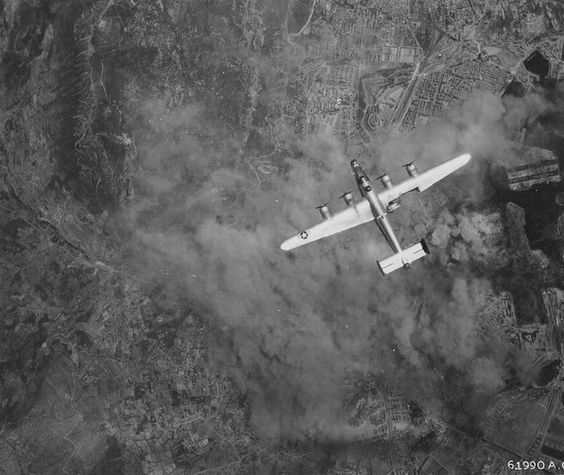 A damaged B-24 Liberator from the 376th American bombardment in flight over Toulon, 1944. 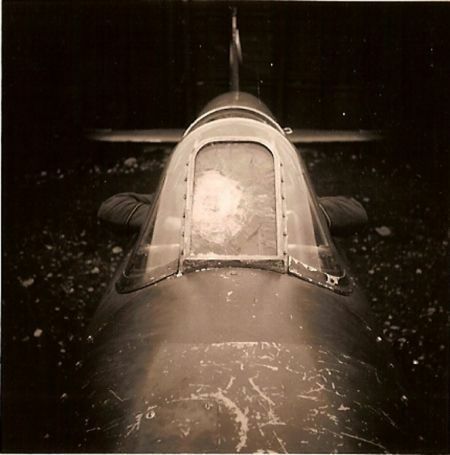 This photo, originating from HMSO publications of the time, had been entitled “Spitfires can take it. 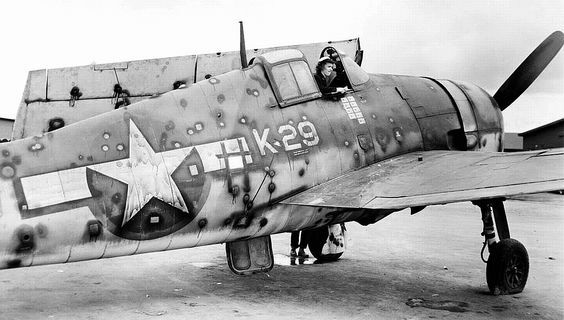 Riddled fighter makes safe landing in Italy.” It is believed to have been taken in 1944 and the aircraft is a Spitfire Mk. V, but regrettably the name of the pilot had not been recorded. Details of the actual event are also unknown, just the picture survives. 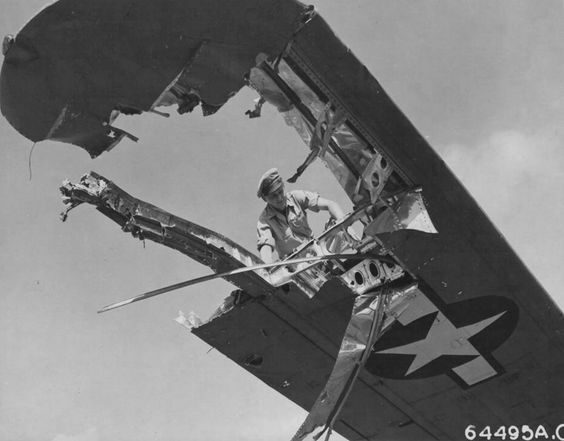 Combat damage to F6F Hellcat, August 1944. 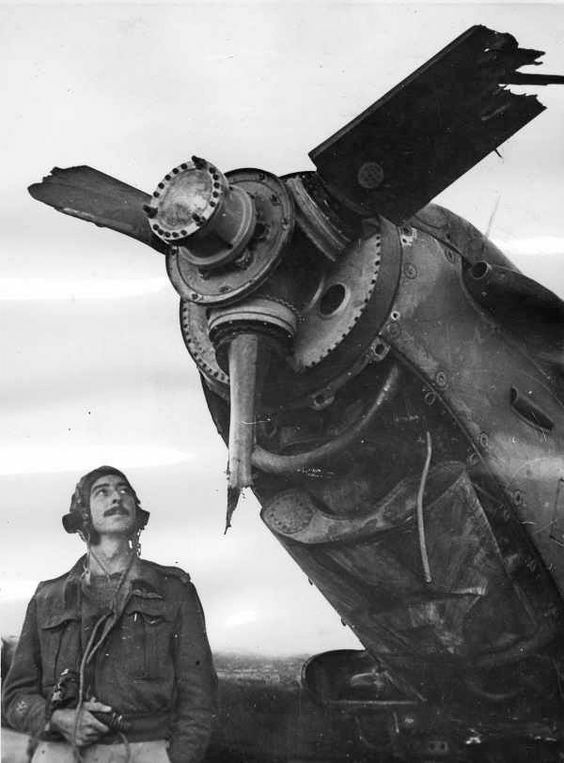 It was a notably tough aircraft, but this pilot was exceptionally lucky to make it home. Hurricane Mk I YB-S. 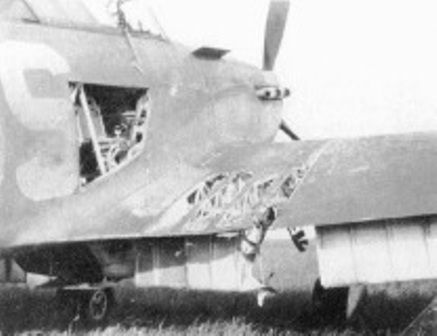 This shows damage from cannon fire that blew apart a section of flap before P/O David C Leary force-landed near Bolbec on the afternoon of 9 June 1940. 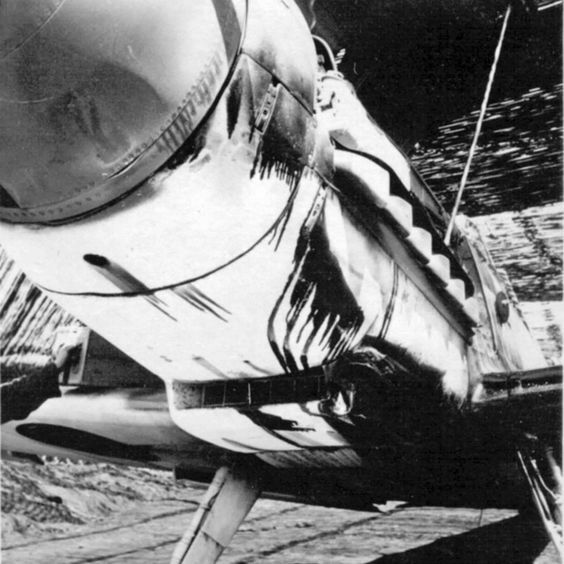 Photo of Messerschmitt Bf.109 with the dripping oil from the damaged engine. De Havilland Mosquito FB Mk VI flown by squadron leader AG Oxlade (pilot) and Lieutenant DM Shanks (crew). 464 Squadron RAAF based at Hunsdon, Hertfordshire. It is parked in Friston, after an emergency landing. Oxlade was hit by "friendly" anti-aircraft fire while chasing a flying bomb V-1 launched from Pas de Calais on February 21, 1944. He suffered engine damage and lost about half of the right wing, but still managed to come back and land successfully in England. Here's a Bf 109F-2 ca.1942. This is not as dramatic a picture as the others with half a wing missing or something like that. However, when you look at it and think about that riddled windscreen, and the pilot somehow surviving shots aimed right at his head and landing the plane, it becomes a little more pungent. 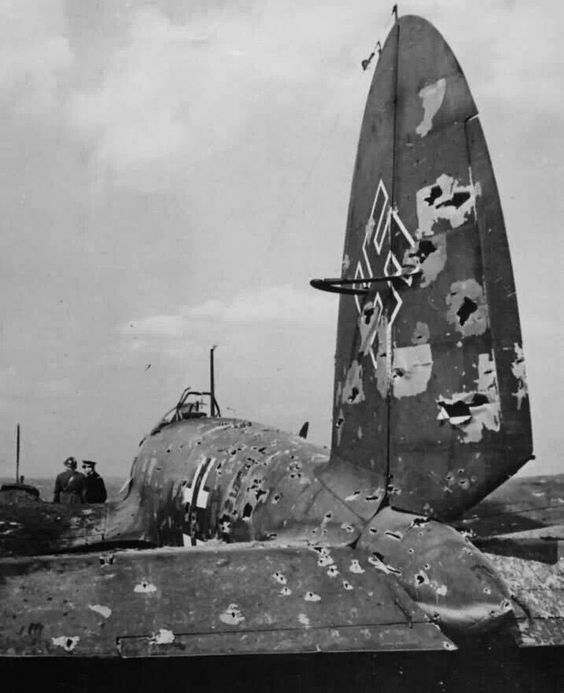 If you are not impressed with that Bf 109 with the shot-up windscreen, below is one from the Allied side with a little better contrast to show what a shot-up windscreen looks like. F/O Philip J "Jack" Frost of No 46 Squadron RAF sits in the cockpit of Hurricane Mk I PO-N in a wooden shelter at Bardufoss on 2 June 1940. 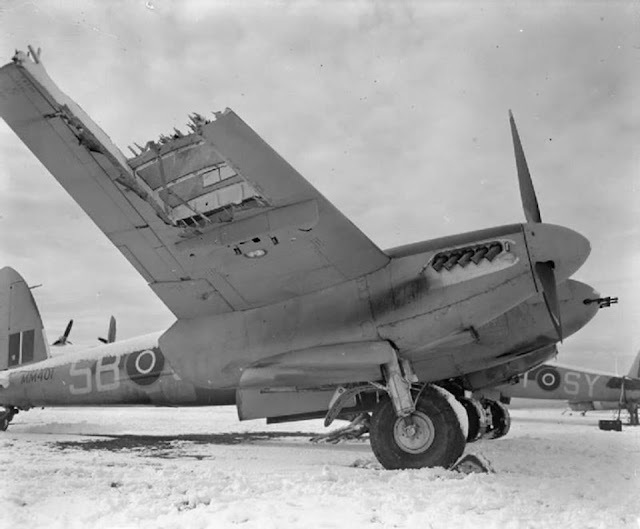 The aircraft was landed by P/O John F Drummond at 15.40hrs, after the armoured windscreen had been smashed by return fire from a Ju 87 Stuka over Narvik. After firing several short bursts, the 20-year-old pilot watched the dive bomber force-land and burst into flames. He was awarded a DFC on 26 July 1940. There's a story to this picture, might as well tell it. It was a strike on Chichi Jima. This Avenger made it back and ditched safely near the US fleet. Only the pilot, Bob King, was aboard when he ditched. 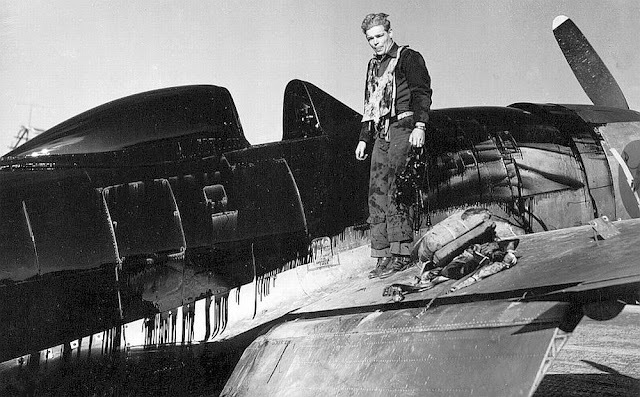 The other two crew members had bailed out after a midair collision with a 2nd Avenger that took off part of the wing (the other plane was flown by Bob Cosbie, and spun into the sea killing all aboard). "I was behind Cosbie's plane. Suddenly, antiaircraft fire shot Cosbie's right wing off. His plane went into a clockwise spin, It slammed into King's plane and the propeller hit King's left wing and chewed off four feet of it. King's plane then went into a spin. King thought they would crash, so he told his crew to bail out. Jimmy and Grady bailed out (and were captured and killed by the Japs). 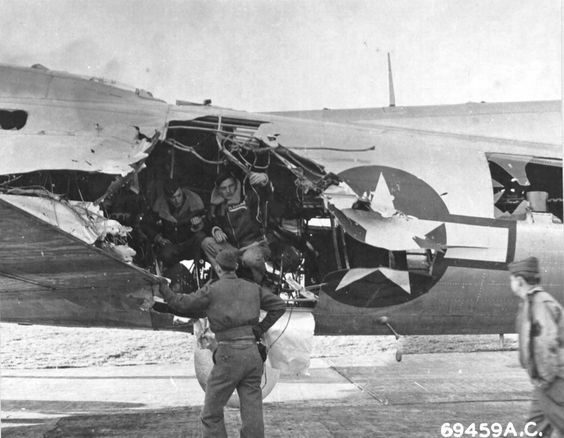 King had his seat belt off, fixing to bail out, and to his surprise, he got the plane straight, he kept flying, nursing his damaged Avenger back to his carrier (USS Bennington). He was accompanied by other planes from the squadron. All who saw the torpedo bomber still airborne with most of its left wing missing were amazed. "We told him his landing gear wouldn't work, that he shouldn't even try," Naul said. "We told him he'd have to make a water landing." 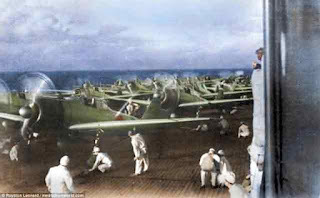 King ditched his plane near the fleet." After his bad jolt, King spent the night in sick bay, but he was alive. He was also a changed man. "King was the most heartbroken man I ever saw in my life," Sengewalt told Bradley. "He lost two men and lived. He didn't say much. I think he never really recovered from that flight, he was so moved. We knew what he went through; no one blamed him. What he did was almost miraculous." Source: 'Flyboys' by James Bradley (Little, Brown: Boston, 2003) pp. 291-301. Crew member examines wing of a Consolidated B-24 "Liberator" which was badly-damaged during pre-invasion raid over Iwo Jima. Marianas Islands. 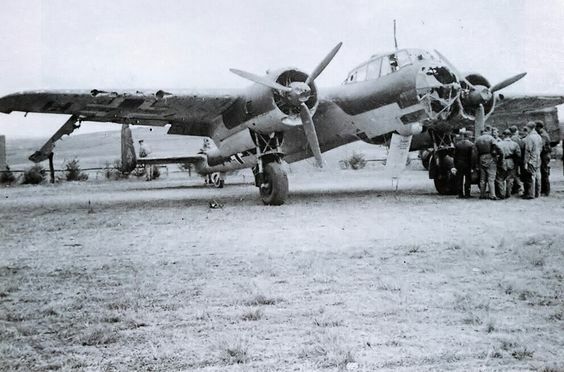 Pictured on 17 May 1940 is the badly damaged Dornier Do 17 Z of Unteroffizier Otto Stephani of ll/KG76. 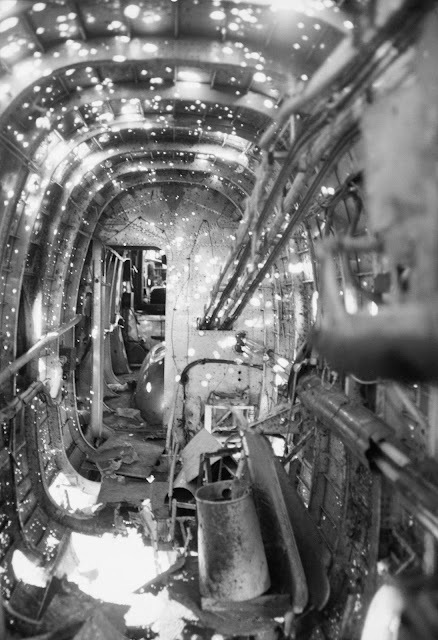 During a strafing run on a French ammunition truck, the truck blew up and showered the passing plane with shrapnel. 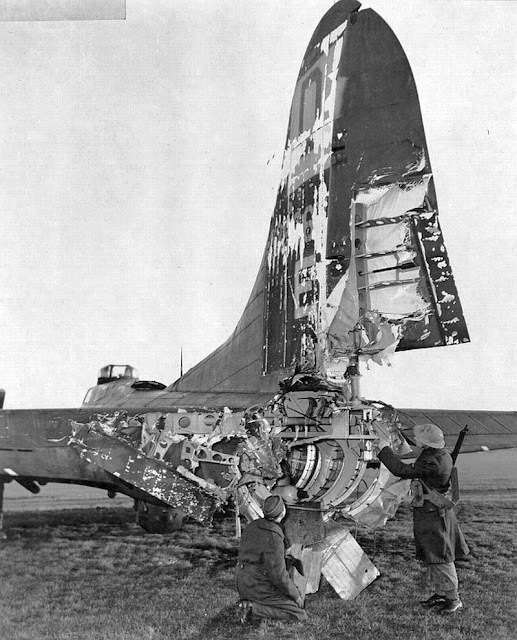 This B-17 Flying Fortress returned to base after literally having her nose blown off by flak over Cologne, Germany on Oct 15, 1944. 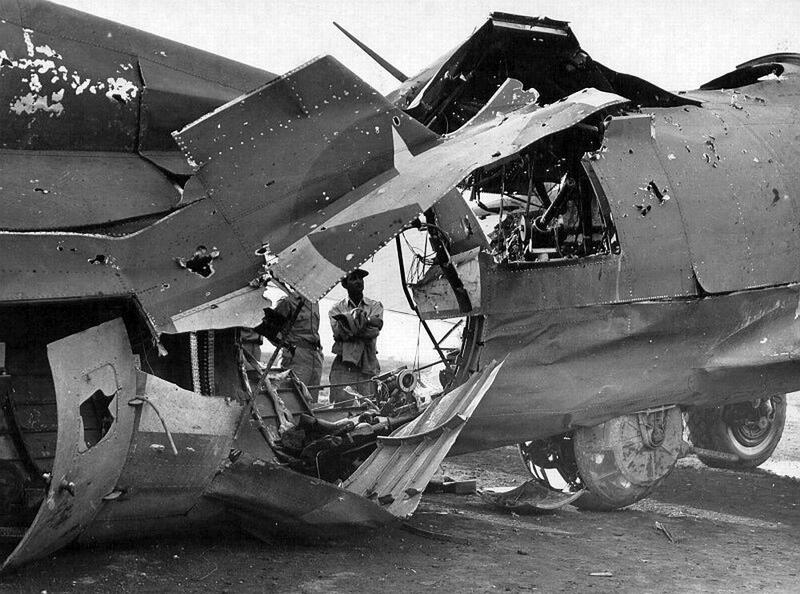 Pilot 1st Lt. Lawrence M. deLancey walked away along the entire crew save one who was killed instantly by the flak. 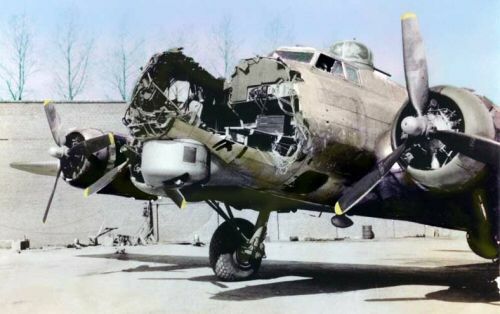 B-17 could absorb a lot of damage and continue to fly, this is a G model. I know this looks like the same plane as above - but it isn't. A Heinkel He 111 after it returned to base after a mission over England in November 1940. Not much information on this one, but somehow the pilot brought it in for a level landing in France during the Battle of Britain. 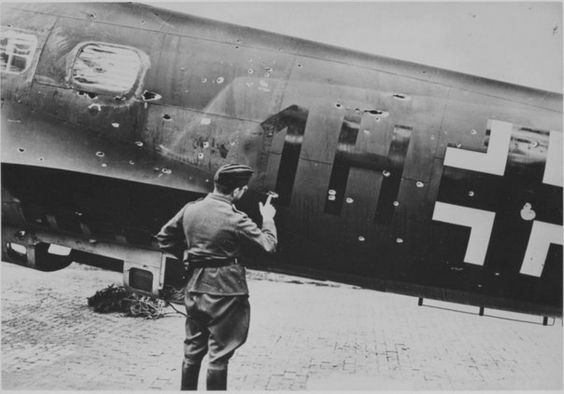 All those bullet- and cannon-strikes and the pilot still survived. August 1940. This is a Handley Page Halifax Mark II bomber. It was flying over Central Europe when an anti-aircraft shell exploded nearby. Those thousand points of light are the result. 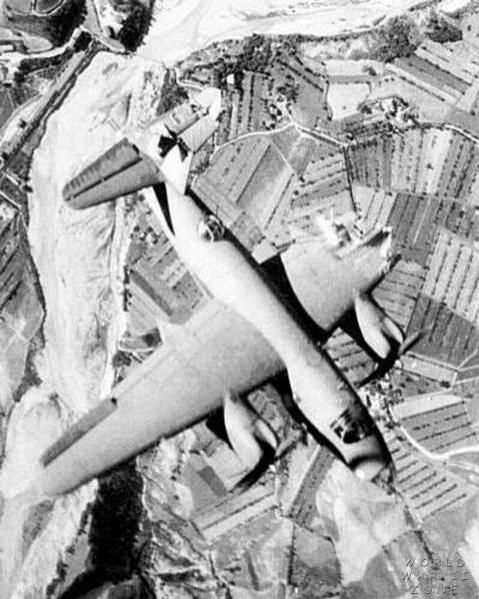 The bomber made it back to base in Italy. 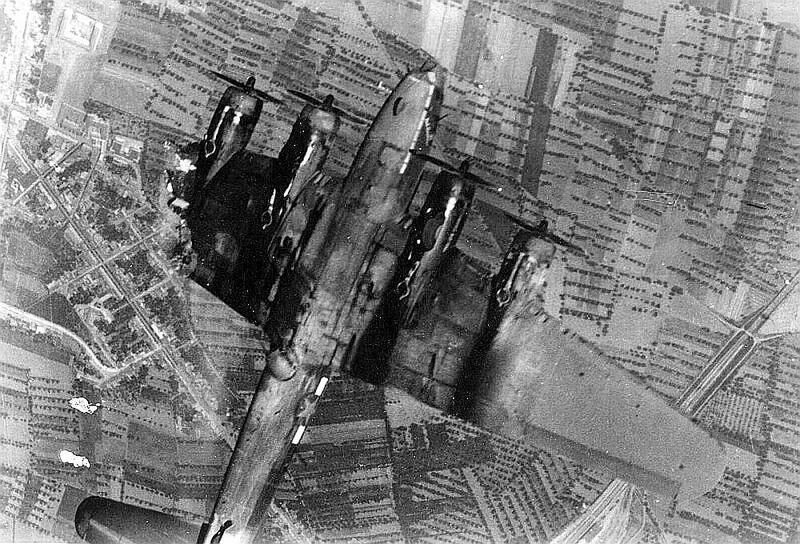 B-17 "Lady B Good" after attack by Me 262 in Berlin raid, March 1945. B-17 "Queen of Hearts", (aka "Li'l Satan") returned after flak killed bomb aimer. The injured navigator bailed and died in German hospital. Tail gunner also mistakenly bailed and became POW. 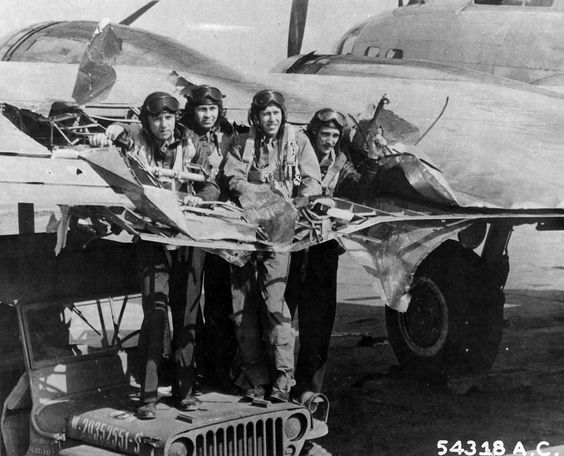 They repaired the plane, and it was later shot down with everyone captured. 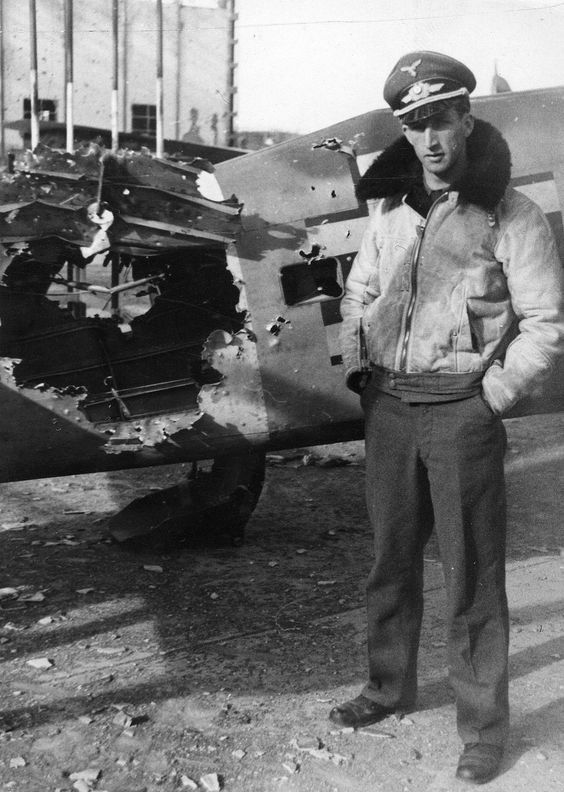 P-47 pilot Lt Edwin King. Flak caused oil leak. Oil is everywhere, including on him. He landed safely, Italy January 1945. The next two photos show the same incident. 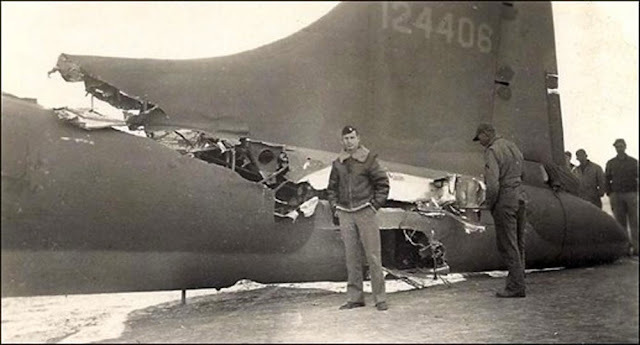 A B-17 collided with a Bf-109, almost slicing off the entire tail section. Losing the tail would have made the plane crash. However, the tail stayed on until the pilot was able to land it. No injuries. As I come across them, I will post photos here which appear to be perfectly timed to show a plane which appears to be capable of flying, but in fact is virtually certain to crash. Unfortunately, most photos in this category won't have much supporting information - the photos will have to speak for themselves, and we will have to draw our own conclusions. 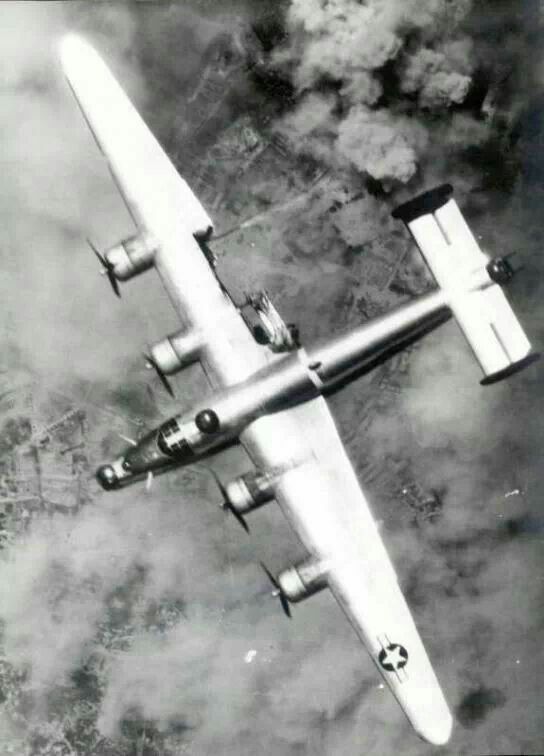 B-17 in trouble. A commenter has pointed out that it appears to have flipped over, and thus is on its way down. The next one I include with reservations, because I don't know what actually happened. One source claims that it made a belly landing after taking anti-aircraft fire during a raid on Tunisia. Other sources say that this was just a well-timed photo, and the plane crashed right after this shot. It appears to be heeling over a bit already, so I go with the latter view - it probably spiralled in right after this shot was taken. B-26 Martin Marauder, 1943. Conflicting sources on this one. My best guess it that it spun in and all KIA, but not sure - a comment below says it is starting to roll over here. 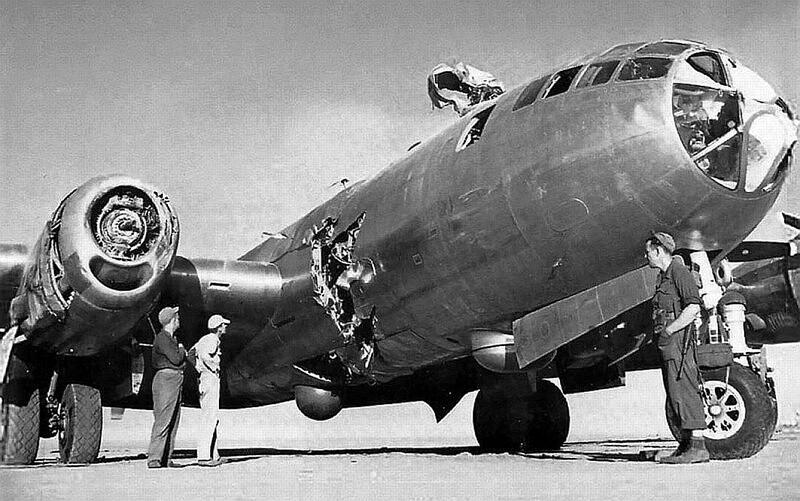 Consider this a "debunking" of the common claim that this plane survived if you will. Cool photo nonetheless. The russian plane with all the holes is faked photo. The Marauder is begging its roll over. That plane was one of the worst to learn to fly because the wings were designed too short. Adding four feet to each improved the plane, but it had a terrible death rate. I imagine that any one of those planes with at least 7 feet torn made the plane made it a death trap. As for the bullet in the windscreen, there are two photos of gun shot to the windscreen. If you will look closely that glass is almost two inches thick! Thank you for the information, I removed the photo of the Soviet plane and added an explanation to the Marauder shot (which I think is a cool shot even if it did spin in). 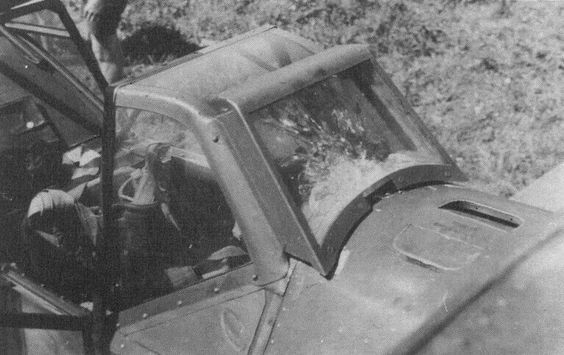 I did not know that the windshields were that thick, I can't imagine the fright you would have if a machine gun bullet was stopped about a foot from your face by glass, no matter how thick. That Heinkel 111 of Unteroffizier Otto Stephani of ll/KG76 is actually Dornier Do 17 Z. It was an amazingly rugged airplane. Yes, now that I give it a good look, you are absolutely right and I made the change. I just blanked on that one, it's clear from the picture. Thanks for the correction. The "B-17 in trouble" was actually in trouble as it seems to be already belly-up and going down. Note the belly turret and the inverted (head down) position of the star.